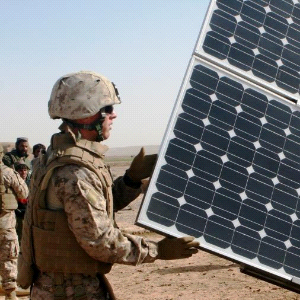 Like every other organization in the world the defense forces also need to invest in the energy transition. This not only benefits the environment, but also to reduces their supply lines, which is key to military strategy. Technologies like waste-to-energy, solar, and wind energy can decrease the need for external energy supply to base camps. Although the use of clean technologies can strategically support a mission, from an environmental perspective the reduction on air bases, army barracks, etc. of greater importance because of the larger potential savings. Massive investments are needed to reduce the military carbon footprint. These investments will also reduce costs, enhance operational success and environmental awareness. Market Forecast researched this market and predicted that the global Clean Energy Tech industry in Defense only, is valued at US$ 110 billion in 2018 and is projected grow at a CAGR of 9.7% to US$ 230 billion by 2026. Their report – “Global Clean Energy In Defense Market and Technology Forecast to 2026” contains in-depth research of the Clean Tech industry market and the global competitive landscape. A first of its kind report highlights enormous potential of technologies like bio-fuel & waste-to-energy. The report sheds light on 7 major technology sectors that are going to dominate the defense industry for the next decade. Demand for Infrastructure s olar power and fuel cells services is anticipated to be driven by the massive investment made by countries like US, China, Russia and the European Union in the development of next generation clean energy and the large-scale procurement of such systems by countries like Saudi Arabia, India, Japan and South Korea. The United States is the largest spender in the domain with China, the European Union, India, Russia, Japan and South Korea anticipated accounting for the bulk of spending.